Hazelwood Green, a former steel mill site that is the City of Pittsburgh’s largest riverfront redevelopment project, Monday announced the design firm Gustafson Guthrie Nichol (GGN) has been selected to create the first public plaza at the 178-acre site. GGN, whose past work includes the National Museum of African American History and Culture, Washington, D.C.; North End Parks, Boston, Mass. ; and The Lurie Garden at Millennium Park, Chicago, Ill., was selected out of a field of 30 design firms that submitted qualifications in response to an RFQ issued in November 2017. The Public Plaza is envisioned as an adaptable and innovative gathering and event space for those who work, reside in, or visit Hazelwood Green and its neighborhood of Hazelwood. Elements of the new Plaza may include benches and seating, green space and native plantings, lighting, public art, and space for seasonal events. GGN will work with local Pittsburgh firms, including Bohlin Cywinski Jackson, Klavon Design Associates, KU Resources, and Santangelo & Lindsay, on elements of the project. Additional partners include DCW Cost Management, SITEGreen Solutions, and Tillett Lighting Design Associates. 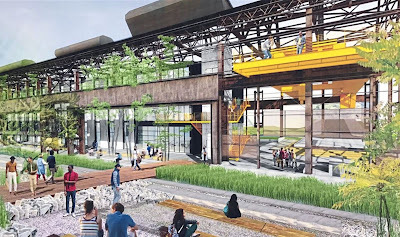 The two-acre space allocated for the Plaza lies south of the Mill 19 building, an expansive former mill structure currently under construction, that will house Hazelwood Green’s first anchor tenants – the Advanced Robotics for Manufacturing (ARM) Institute and Carnegie Mellon University’s Manufacturing Futures Initiative. Mill 19 will open out onto one of the Plaza’s four sides, with a second side facing Hazelwood Green’s Main Street – Lytle Street – that will begin construction this summer. The remaining two sides of the Plaza will be framed by future buildings that will activate first floor uses facing the Plaza as market interest evolves. Design for the Plaza will commence in June, with construction anticipated to begin in early 2019, with a late summer or early fall completion date. GGN’s proposal was selected by a nine-member advisory committee that included: Karen Abrams, Program Officer, Equitable Development, The Heinz Endowments; Rebecca Flora, AICP, LEED BD+C/ND, Hazelwood Green Project Director; Raymond W. Gastil, AICP, Director, Department of City Planning, City of Pittsburgh; Nicole Graycar, AIA, Project Manager, Campus Design and Facility Development Carnegie Mellon University; Don Johnson, Senior Development Manager, Regional Industrial Development Corporation (RIDC); Sean C. Luther, Executive Director, InnovatePGH; Lawrence T. Mangan, Treasurer and Chief Financial Officer, C.W. Benedum Foundation; Sam Reiman, Associate Director, Richard King Mellon Foundation; and Tim Smith, Executive Director, Center of Life, Chair, Greater Hazelwood Community Collaborative (GHCC). The selection process was facilitated by Mary Navarro and the Plaza’s project manager, Katrina Flora, AICP. For more information, visit the Hazelwood Green website.